A beachy bulletin board (full of ocean puns! ), a “Whalecome” sign, and a “No Shell Phones” box — all DIY! Is it really time to get ready for back-to-school? I swear the summer goes faster and faster each year. But, no matter how long summer lasts, I’m always grateful for the block of time that can be devoted to things like house projects, our children’s book endeavors, adventuring & vacationing, connecting with family and friends, and summer crafts. But, as the first day of school swiftly approaches, I must to come to grips that I’d better get ready for my new group of students to come through the classroom door! So to welcome this new crowd, I added a few DIY crafts to go along with the ocean theme. 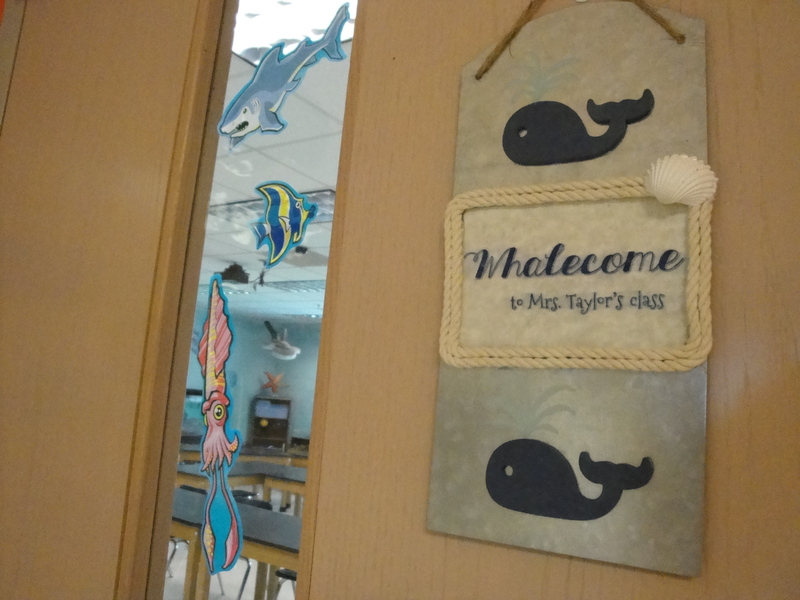 It is certainly one of my life’s passions to share the ocean’s magic with others, and classroom décor gives the perfect setting to do this. Who doesn’t love a good ocean pun? Well, get ready for them because this post is filled with them! To make this one, I printed the message on parchment style printer paper, cut it out, and then used Mod Podge to glue it to the metal and over the top to seal it and add texture. I then hot glued rope around the message and also a shell on top of the rope in the corner to cover the ends of the rope. Last but not least, I painted the whales dark blue, hot glued them to the metal, and then painted the spout with aqua acrylic paint. 1. Use Mod Podge to glue message to metal. 2. Paint the front with Mod Podge to seal and give texture. 3. Hot glue rope around the edge of the message. 4. Hot glue a seashell over the corner to cover the rope ends. 6. Hot glue the whales to the metal. 7. Paint in the whale’s spout. I love how this turned out and it almost makes leaving summer behind a breeze! The weathered wood paper really sets a beachy tone, and dollar-store fish print scarves work as a sweet border. I painted a piece of balsa wood with a blue and aqua background, and then stamped the letters on with a computer printout and paint pen to make the “Ocean Wisdom” sign. After hot gluing a faux sea star and thumbtacks to the back, it was ready to go! 1. Paint balsa wood with two colors, navy blue and aqua. To get the streaked look, dispense paint onto board and make minimal paint strokes. 2. Print out the letters and cut them into individuals. 3. Flip the letters over and quickly fill in the lines with a paint pen. 4. Quickly stamp it onto the board. 5. Fill in gaps with the paint pen. 6. Hot glue the faux starfish and attach it to the board. …to the back of the board. I didn’t want to cover up the weathered wood effect so I printed the ocean messages on transparencies and attached them with silver thumbtacks. I had a few wooden anchors (about 30 cents each) that I painted using the same blue and aqua colors as the “Ocean Wisdom” sign. In my craft stash, I also discovered a couple of aqua artificial starfish, so I hot glued a thumbtack to the back of them and also to the anchors to attach them to the bulletin board. Works as a sign to remind my tech-savvy high school students to keep their cell phones put away, and also as a place to put them if they need help staying focused! 2. Once dry, place the stencils. 3. Use a foam pouncer to add paint to the stencils. 4. Remove the stencils, rinse and dry, then replace to finish. …and place them on the box. Have a favorite ocean pun? Hit me with a comment, I’d love to hear your feedback! I had AG dept make me mini surfboards that I put my sayings on. Have a whale of a day. Seas the day. Make waves. Be shore to smile, Avoid pier pressure, sea life’s beauty. Is that enough for you? Haha! Love it! PS – Best wishes (or should I say best fishes) for a fabulous school year!